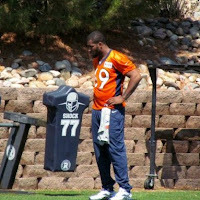 When the Denver Broncos closed out OTAs earlier this week, rookie pass rusher Quanterus Smith was back on the practice field. Smith missed the final two games of his collegiate career due to an ACL tear in his left knee but went on to be drafted in the fifth round (146th overall) by the Broncos in April. After he recorded 12.5 sacks during his senior year at Western Kentucky, Smith's ACL injury put his ability to participate in offseason activities in question. Smith was able to participate in individual and position drills on Tuesday and Wednesday, according to Mike Klis of the Denver Post. If all goes well, Smith should be able to fully participate in practice by the time training camp rolls around in late July. "They’re doing a great job with it with the little time we’ve had. But everything feels good. I don’t feel like I’m babysitting it too much," Smith told the 'Post. In May, Smith signed a four-year, $2,354,452 contract with the team that included a $194,452 signing bonus, according to Spotrac.com. If he plays out his contract, he'll be in Denver through at least the 2016 season. At 6'5", 250 pounds, Smith (23) is expected to compete for a rotational roll on Denver's defensive line this summer. After recording 24 sacks in college, Smith has the potential to be productive in Year One for the Broncos.